Hier finden Sie sowohl Motorradreifen für unsere Typen MZ, Simson, Jawa, AWO, EMW und IWL als auch universal speziell für Oldtimer abgestimmte Decken wie Zündapp oder BMW. Wir bieten ein großes Sortiment dieser Reifen in unterschiedlichen Größen und Qualitäten an. Um Ihnen die Auswahl zu erleichtern haben wir die unterschiedlichen Typen intern getestet, beachten Sie dazu unsere Tabelle in der Beschreibung. Hauptsächlich führen wir die Marken Heidenau, Mitas, VeeRubber und Fortune. Bei der Auswahl beachten Sie bitte immer Ihre Eintragung dazu in den Fahrzeugpapieren. 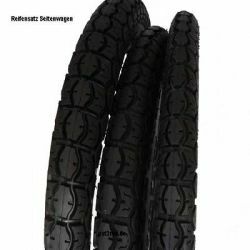 Set tyres ES250 street 16"
High-quality street tyres of Heidenau. 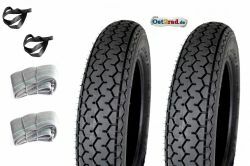 For all MZ with 16" rims. Especially for the old-timers ES 175 and ES 250 put together. Made in Germany. 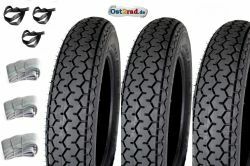 The exact name of the tyres: 3,25-16 K36 and 3,50-16 K33. Both ripe Reinforced and 55P, admitted to 150 km/h. Both profiles are tuned on each other and almost same. Of course also for all the other models like ES and TS if these tyres are entered in the papers and are permissible. 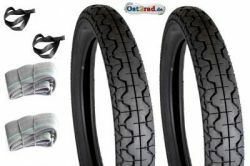 This set is including flexible tubings and rim tapes! Reifensatz der Marke Mitas (früher auch Barum) der Größe 4,00 - 19 H 02. Es handelt sich um ein klassisches Straßenprofil mit Oldtimer - Block - Profil, mit sehr hoher Standfestigkeit, geeignet für Oldtimer Modelle mit dieser Reifengröße auf dem Vorderrad oder Hinterrad und Beiwagen, dazu bitte Eintragung in den Papieren beachten, wie Typen Ural, Dnepr, BMW und andere Oldtimermotorräder wie NSU und Zündapp. Die genaue Bezeichnung des Reifens lautet 4,00-19 M/C 71P TT H-02 . Dieser Mantel ist tragkraftverstärkt und bis 150 km/h zugelassen, mit Straßenzulassung, auch für Seitenwagenbetrieb geeignet, neue Produktion. Zu den 2 Stück Reifen werden hier im Satz die Felgenbäder und Schläuche mit Ventil geliefert. Sehr stabile Reifen im klassischem Straßenprofil, sehr tief geschnitten dadurch lange Lebensdauer und guter Grip auch bei Nässe. Marke Mitas (früher Barum), made in CZ. Die genaue Bezeichnung 3,25 - 18 H03 59P Reinforced für Vorderrad und 3,50 - 18 H03 65P(bis 150 km/h zugelassen, tragkraftverstärkt) für Hinterrad. Auch für Seitenwagenbetrieb geeignet! 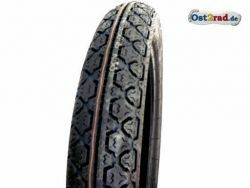 Very stable tyres in the classical street profile, profile like it was offered earlier also by BARUM, brand Mitas, made in CZ. The exact name for in front 3.25 - 16 H-05 55P Reinf. (to 150 km/h admitted and load-carrying capacity-increasingly), for behind 3,50-16 H-06 64S. (to 180 km/h admitted and load-carrying capacity-increasingly). 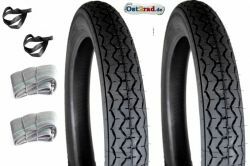 General tip to our Mitas - tyre: All tyres are a new production, they are admitted for front wheel and back wheel and own street licensing, all profiles are tuned on each other, for the same optics in front and behind. 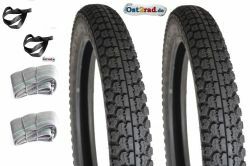 In this offer the rim tapes and the tubes with valve are also delivered to 2 tyres. Very stable tyres in the classical street profile. Brand Mitas, made in CZ. The exact name 2.75 - 18 H-06 48P Reinf. for in front and 3.50 - 18 H-06 62P Reinf. for behind (to 150 km/h admitted and load-carrying capacity-reinforced). 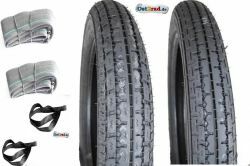 In this offer the rim tapes and the flexible tubings with valve are also delivered to 2 tyres. 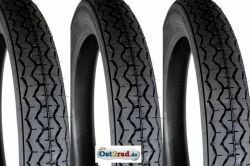 Very stable tyres in the classical street profile, profile like it was offered earlier also by BARUM, brand Mitas, made in CZ. 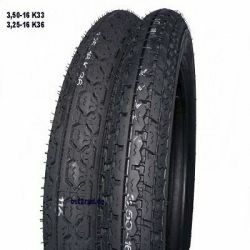 The exact name of both tyres 3.25 - 16 H-05 55P Reinf. for in front and behind (to 150 km/h admitted and load-carrying capacity-reinforced). Sehr stabile Reifen im klassischem Straßenprofil. Marke Mitas, made in CZ. Die genaue Bezeichnung 2,75 - 18 H-06 48P Reinf. für vorn und 3,25 - 16 H-05 55P Reinf. für hinten (bis 150 km/h zugelassen und Tragkraftverstärkt). Speziell für MZ der Typen ETZ 251 und ETZ 301 abgestimmt. Unsere Empfehlung für Vielfahrer, da sehr langlebiger Reifen. 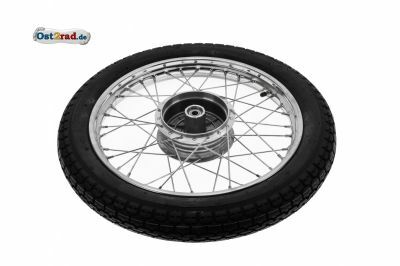 Ceiling for back wheel, especially for the MZ - model ETZ 250. This tyre is admitted to 150 km/. German production. Classical street profile, reinforced implementation. High-quality street tyres of Fortune. The best processing, in an ultra-modern way by nylon gain. If the necessary standard, admitted at least to 140 km/h excels by far. These tyres own the standard ISO-9001. Please, check the entries in your papers, because of the width. Very nice street profile, guarantees the best processing! It concerns a classical street profile with high profile deepness, so that you take long pleasure in the tyres! The profiles are same, absolutely suitably for everyday life also on wet pavement still of excellent Grip, by the extreme profile deepness. 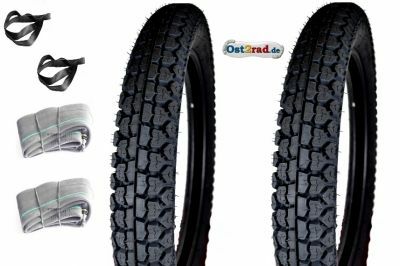 New tyre, no mature product. They can put together the set to themselves in this offer themselves. Following sizes stand for the choice: 3,00-16; 3,25-16; 3,50-16; 2,75-18; 3,00-18; 3,50-18. 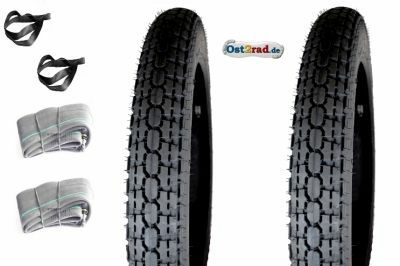 This offer is valid for 3 pieces of tyres. Please, call to us after the order your necessary measures. You take the exact name please from the products in this shop, or you ask for please.